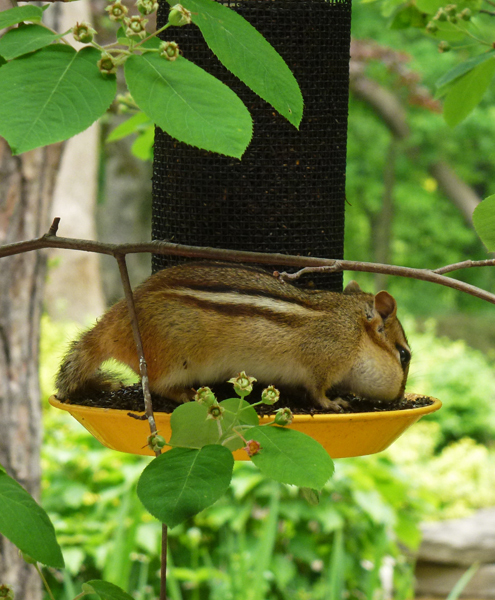 I spotted this cheeky chipmunk this week at the Veterans Centre at the Sunnybrook Health Sciences Centre. I was standing no more than 4 feet away from it as it continued to stuff its cheeks full of the seed from this bird feeder. It totally ignored me! Hello, it is amazing how much they can fit into those cheeks. Cute critter! They are friendly and wise as the stock up on food for the winter months. It must feel pretty safe in the environment around the health center. I wonder how the birds feel about this little poacher. This is how lots of animals get in trouble...they're too engaged with food or something else to see the danger around them. But, in this case, I think little chippy understood that you did not represent danger but were just another photographer so there was no need to get all fearful and run away. I wonder why we have no chipmunks in this part of the world? My daughter has problems with them undermining her front porch. She's trying to capture them too. Just not with a camera. Oh, he's adorable!! Nice shot! That chipmunk knows exactly where to get a free meal, and it managed to climb right up there. It has its priorities straight. Oh what a great photo! When a chipmunk is hungry, it's just gotta eat. It totally ignored you? Good food is much more important ! Chipmunks and squirrels and bunnies are EVERYWHERE this year.